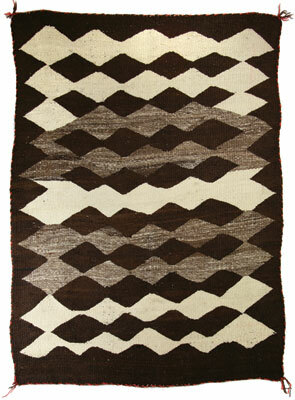 Saddle blankets occupy a curious niche in the history of Navajo weaving. 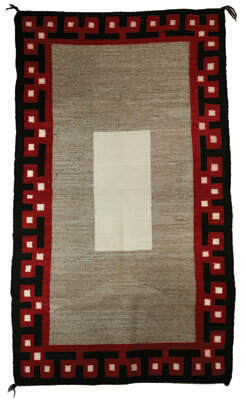 They are the only type of textile that were simultaneously popular among Anglos, Hispanics and the Navajo themselves. Consequently saddle blankets have an aesthetic and technical history very different from that of the ubiquitous Navajo rug. The Navajo learned weaving from their Pueblo neighbors about the same time they acquired horses and churro sheep from Spanish settlers, in the mid- to late-seventeenth century. They readily integrated all three, using horses for herding sheep and using the sheep for textile fiber, as well as for food and trade. When Navajo horsemen started making wooden and leather saddles adapted from Spanish examples, they probably used sheepskin pads as did the Spanish. 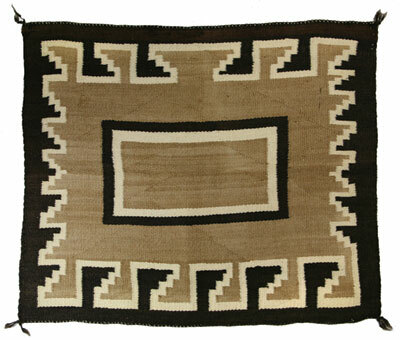 By the 1860s, Navajo weavers were making saddle blankets, which soon became the preferred choice. The earliest saddle blankets were essentially smaller versions of the wearing blankets the Navajos made for their own use and for trade. They featured patterns of horizontal stripes using natural white, brown or grey wool plus indigo-dyed blue, and red made from unraveled red trade cloth known as bayeta. Weavers often embellished the stripes with stepped geometric motifs or serrated diamond shapes, the latter having been adapted from Spanish and Mexican textiles. In an effort to put an end to Navajo raids on Anglo and Hispanic settlers and Pueblo Indians, the US government hired Kit Carson to round up the Navajo. To accomplish this, he led a campaign to slaughter their sheep and destroy their crops and homes, driving the refugees to an internment camp at Bosque Redondo in eastern New Mexico. During their detention from 1864 to 1868, the government supplied the weavers with factory-produced yarns, generically known as “Germantown” after the spinning mills in Germantown, Pennsylvania. After the Navajo returned to their homeland, the government continued to supply them with Germantown yarn, but also brought in a new breed of sheep, called merinos, to rebuild Navajo flocks. The annuity payments of factory yarn ended in 1878 and, although they still could purchase Germantown from traders, the weavers gradually returned to shearing, spinning, and dying their own wool. From at least the 1880s on, Navajo weavers made three general classes of saddle blankets: simple, striped pieces; more decorative blankets with borders; and “fancy” blankets with complex overall patterns. The three types also were differentiated by the tightness of spinning, density of weaving, and the way they were used. All three types were made as both single and double blankets, the former ranging from about 24″ by 30″ up to 30″ by 35″ and the latter from about 28″ by 50″ to 35″ by 65″ or longer. Riders folded the double saddle blankets in half, doubling the protection they gave the horse. Judging from their rate of survival, double blankets were much more commonly used than the singles. The simplest blankets were coarsely woven with fat, spongy yarns, and were intended as workaday pieces that would be worn out and discarded within a year or two. 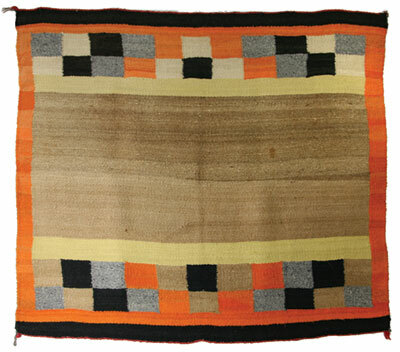 Many of these “common” saddle blankets were composed of horizontal stripes (when the warp threads are oriented vertically) sometimes enhanced with simple motifs at the corners. Others had narrow vertical stripes, a pattern relatively easily woven by alternating single weft yarns of contrasting color. A related overall pattern of small squares in a solid field took only slightly more time to weave. The Germantown eyedazzlers and other complex and colorful patterns defined the fancy blankets which were more tightly spun and woven. Very often, the fancy blankets were not used under the saddle where they would receive heavy wear, but were placed on top of the saddle to give the rider a bit of extra padding, or tied behind the rider as saddle decoration. 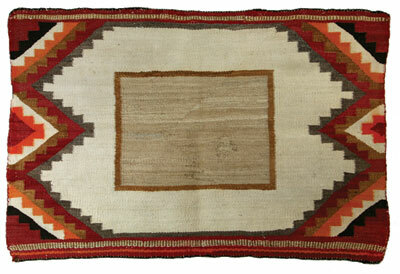 Fancy saddle blankets frequently had applied fringe and large tassels, adding to the showy effect. Those intended for use at the back of the saddle usually were singles and often smaller than utilitarian single saddle blankets. 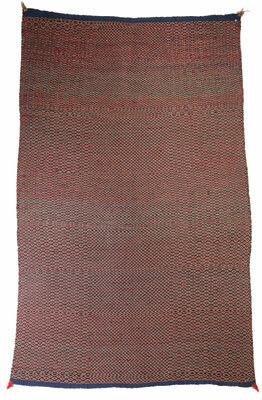 The fancy saddle blankets were much prized by their owners, but it was the intermediate class of blankets on which the weavers lavished the most creativity. 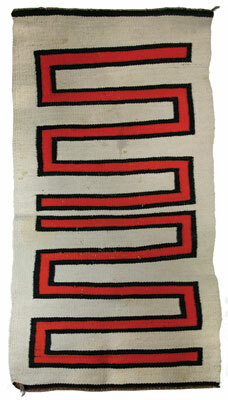 They were acutely aware that only the edges and corners of the saddle blankets were visible under a saddle. They responded by developing designs which made a virtue of that fact, looking decorative and lively while in use, but oddly spare and restrained when unfurled because the central parts were left plain. The simplest of this class had only geometric corner motifs for decoration, while the more ambitious weavings had geometric borders with or without separate corner motifs. 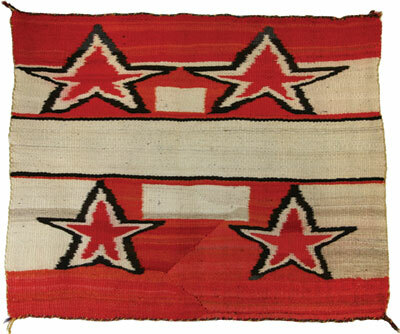 Double blankets usually were divided in half by a border stripe or other banded design which would be visible at the front of the saddle when in use. Occasionally the weaver would create a different pattern for each half, or use the same pattern but reverse the colors, or leave one half plain. Unmatched halves allowed the rider to get two patterns out of one blanket. 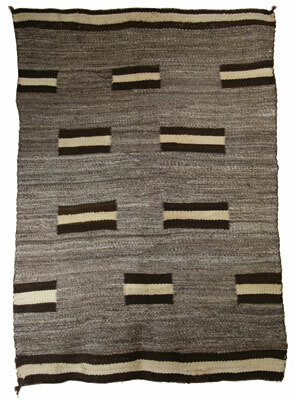 The bordered blankets seem to have been made in double size far more frequently than as singles. 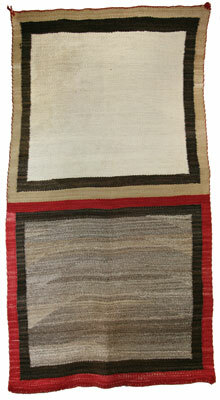 Variations on the middling type of saddle blanket included twill weaves and double weaves. 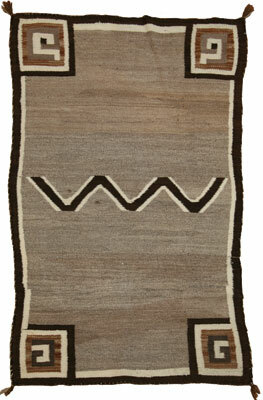 Although far less common than the simple flat weave (known as tapestry weave) twill wearing blankets had been part of Navajo weaving since at least the early 18th century. From the 1880s forward, twill was used almost exclusively for saddle blankets and was commonly executed in overall patterns of concentric diamonds using two or three contrasting colors. The twill weave also was used to make the saddle cinch, an elongated oval woven around a large iron ring at either end. 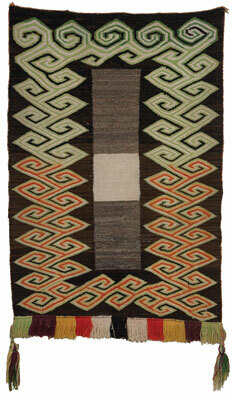 Double-weave textiles were rare among the Navajo and were far more complicated to make than either twill or tapestry. Most examples were made as saddle blankets and, unlike all other Navajo textiles, they often have entirely different patterns on each face. 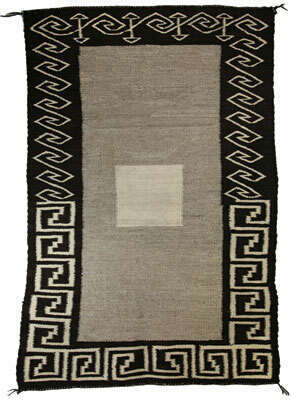 By the turn of the 20th century, Navajo weavers had created a distinct set of design concepts for saddle blankets. 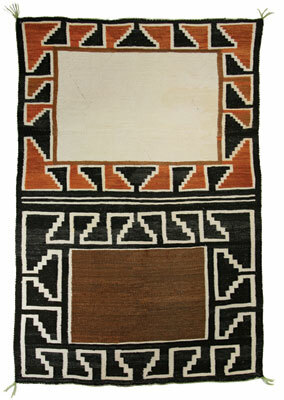 The traders had less influence over these designs than they did over rugs of the period because weavers still were making them for Navajo use, whereas rugs were made for sale to the Anglo world. 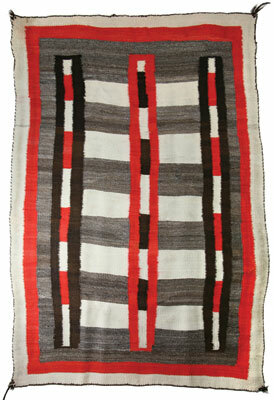 As a result, saddle blankets typically did not follow the “regional styles” which were specific to various trading posts around the reservation such as Ganado, Crystal or Two Grey Hills. The Navajo originally made saddle blankets for their own use, although military men and ranchers who had early contact with them also valued the weavings. By the 1880s, with flocks re-established and the reservation trading post system in place, weavers began to produce saddle blankets in commercial quantities which the traders wholesaled to saddlemakers and other retailers. They quickly became the favorites of cowboys and ranchers who appreciated their durability and happily discovered that the coarse weave of workaday blankets let air circulate over the horses’ backs. 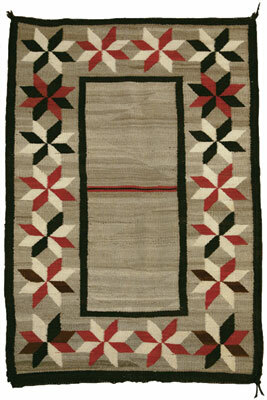 Cowboys who could afford the premium price often chose the twill-woven and double-woven blankets because they were much thicker and even more durable than the tapestry weave blankets. 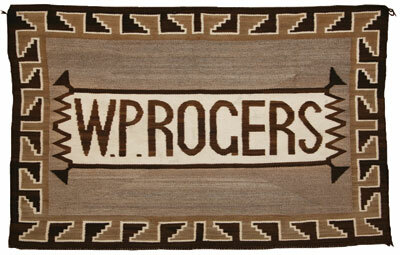 Anglo and Hispanic ranchers also purchased fancy blankets, paying as much as five times the price of the common article, and using them much as the Navajos did. 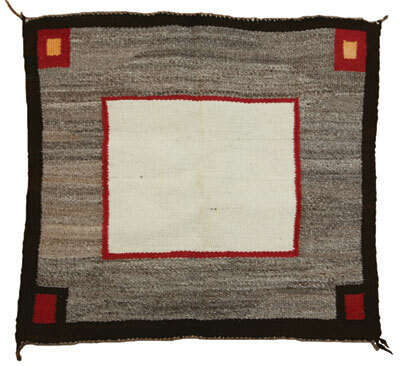 By the early years of the 20th century, Navajo weavings dominated the saddle blanket trade throughout the Great Plains and Western states, and were widely considered superior to any factory-made blankets and saddle pads. During the Dust Bowl years of the 1930s, the U. S. government forced the Navajo to dramatically reduce the size of their flocks in hopes of improving rangeland devastated by drought and overgrazing. Fewer sheep meant less wool and fewer blankets, causing prices to rise steadily throughout the following decades. Moreover, the availability of off-reservation employment during World War II and beyond drew many Navajos away from sheepherding and weaving as their primary livelihood. By the 1960s, Navajo saddle blankets-especially the common types-largely were priced out of the market increasingly dominated by mass-produced saddle pads. 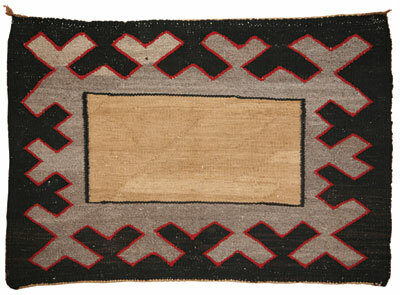 The Navajo’s own use of their saddle blankets decreased in the late 20th century for the same reason. 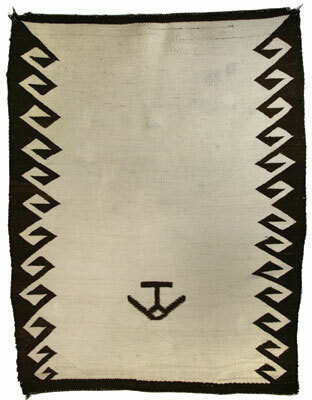 Nevertheless, a few weavers continue to weave them, often in diamond twill and double-woven two-faced designs, which they sell mostly as rugs or art pieces. The last two decades have seen a sharp rise in demand among collectors for older Navajo saddle blankets. 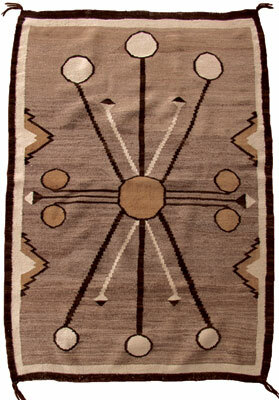 Surely, many buyers are interested in their history and the fact that they are a type of textile that the Navajo continued to make for their own use long after they stopped making blankets for themselves and started producing rugs for the traders. Their broadest appeal, however, lies in a distinctive aesthetic that not only is unlike textiles from other cultures, but also unlike other Navajo weavings. Although we can never know all of the meanings and nuances of their aesthetic origins, they do give us a glimpse into the Navajo way of thinking. And, on the purely subject level, they are masterful works of abstract art. This article was excerpted from Canyon Road Arts: The Complete Visitors Guide to Arts, Dining and Santa Fe Lifestyle, Vol 5, 2009-2010, pages 92-99. Canyon Road Arts is published by Medicine Man Gallery. All rights reserved.